Milson Serviced Apartments, 4 star self contained executive 1 bedroom apartments accommodation, located in Milsons Point on the lower North Shore of Sydney, just a stone?s throw from the Sydney Harbour Bridge and magnificent surrounding waterways, parks and eateries. Why stay in a motel room when, for the same price, you can have the luxury of staying in fully furnished self contained apartment accommodation? Escape the hustle and bustle of city life and relax in this superb neighbourhood only minutes away from the Sydney CBD. All types of travellers can take advantage of the discount accommodation at the Milson Serviced Apartments, as well as the range of modern amenities including direct internet access, disabled facilities, free car parking, guest laundry, gym & fitness equipment, lift, indoor pool and baby cots available. The Milson Serviced Apartments facilities include a heated indoor pool, a fully equipped gymnasium and FREE car parking. North Sydney pool is also just a short stroll down the road. Nearby Attractions : Conveniently close to the Sydney CBD, but still on the northern side of the Sydney Harbour Bridge allows a huge variety of opportunity. You will have all of the CBD attractions available to you including locations like Darling Harbour and the IMAX Theatre, Sydney Wildlife World, Sydney Aquarium, plus all of the restaurants, galleries and venues between Cockle Bay Wharf and Circular Quay. If you wish to stay out of the city on the other hand, a short stroll will take you up to North Sydney's shops or you can head up to the Northern Beaches for a day at the beach or just to enjoy the sights that the beaches have to offer. If still none of those options appeal to you, why not just relax on your balcony and embrace the views. 1 Bedroom Harbour Apartment : Sleeps up to 4 guests on 1 Queen Bed Extra Roll Away 1 Double Sofa Bed Extra. 1 Bedroom Queen Apartment : Sleeps up to 2 guests on 1 Queen Bed. 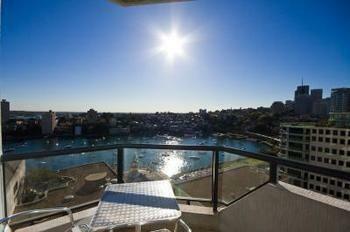 2 Bedroom 2 Bathroom Waterview Apt : Sleeps up to 4 guests on 1 King Bed And 2 Single Beds. 2 Bedroom 2 Bathroom Apartment : Sleeps up to 4 guests on 2 Kings Or 1 King And 2 Singles . 3 Bedroom 2 Bathroom Penthouse : Sleeps up to 6 guests on 2 Queens And 2 Single Beds. 2 Bedroom Parkview Apartment : Sleeps up to 4 guests on 1 King & 1 Single Bed + Rollaway Bed. 3 Bedroom Apartment + Terrace : Sleeps up to 6 guests on 1 King & 2 Queen Beds. 3 Bedroom Bridgeview Apartment : Sleeps up to 6 guests on 1 King & 2 Double Beds. 3 Bedroom Apartment : Sleeps up to 6 guests on 2 King & 1 Queen Bed, Or 1 King, 1 Queen & 2 Single Beds.